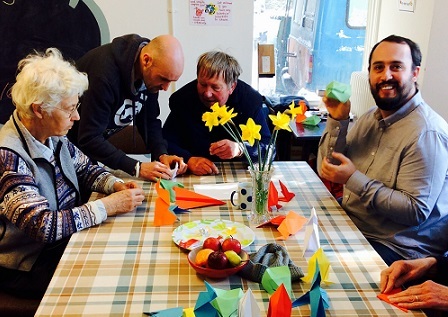 Skills Café today was led by our Liam who expertly and patiently instructed us in the Art of Origami. We enjoyed Sushi for lunch too and all agreed it was worth the walk through the snow to get to Manna House for today’s session. Join us next week for our Spring visit to Growing Well to plant seedlings. Meet at Manna House at 9.30am and please let Clare know if you’re planning on coming!